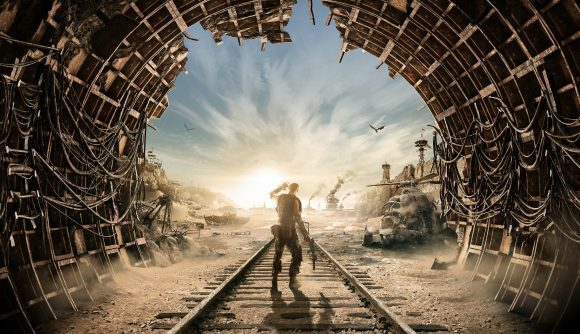 Metro Exodus will be pulling into the station – that is to say, your hard drive – in a few short weeks, and now we’ve had a look at the recommended hardware you’ll need to power its locomotive across the blasted landscape of post-apocalypse Russia. 4A Games have been showing off Metro Exodus’ use of the latest in graphics processing power over the past several months, and if you’ve got the GPU power to do it, you’ll be able to see Artyom’s collection of handcrafted firearms lit by raytraced light sources, courtesy of Nvidia’s latest RTX graphics cards. However, Metro Exodus looks pretty forgiving for players who haven’t shelled out for the newest line of video cards. The minimum specs include an Intel Core i5-4440 or equivalent, and merely a GTX 670, 1050, or AMD Radeon HD 7870, with 2 gigabytes of VRAM. Things ramp up quickly though if you want to see Metro Exodus closer to how it was meant to be played. For recommended settings, 4A suggests a GTX 1070, RTX 2060, or an RX Vega 56 – all with 8 gigs of VRAM. You’ll also need a Core i7-4770K or equivalent processor, and these settings require DirectX 12. 4A has provided additional recommendations, for “high” and “extreme” settings. As you might imagine, these get significantly more demanding – for high, you’ll want a 1080 Ti; and for extreme, nothing but an i9-9900K CPU with a top-of-the-line RTX 2080 Ti will do. The Metro Exodus release date is set for February 15, and it follows series protagonist Artyom as he leaves the Moscow metro and heads across country in a reclaimed locomotive. The series thus far has made its bones in dark, cramped corridors and spooky abandoned buildings, so it’ll be interesting to see how it fares with the transition to sunlit outdoor areas.